Danes are unrivalled in satisfaction with life. The University of Leicester recently published the World Map of Happiness (http://news.bbc.co.uk/2/shared/bsp/hi/pdfs/28_07_06_happiness_map.pdf) with Denmark as number one. For more than 30 years this country with five million inhabitants has ranked first in Eurobarometer surveys (europa.eu.int/comm/public_opinion/index_en.htm). More than two thirds of Danes are “very satisfied” with their lives according to these surveys. In no other Eurobarometer country has this proportion exceeded a half, and for most of the countries the proportion is less than a third (figure)⇓. To explain Danish contentment we sifted through literature, statistics, and common knowledge. We focused on accounting for why life satisfaction in Denmark substantially exceeds that in Sweden and Finland, the two Eurobarometer countries most similar to Denmark. We have ordered our hypotheses roughly from most to least implausible. Genes—Genetic factors might influence differences in life satisfaction within a country,2 and Danes might have a special genetic constitution. Genotypes in Sweden, however, are similar to those in Denmark because most Swedes were Danes until the 17th century. Food—Meals in Denmark can be politely described as unmemorable. “Danish cuisine” is an oxymoron, except perhaps the open faced “butter breads” that accompany the beer and aquavit Danes consume for lunch. Older Danes satisfy their hunger with potatoes, gravy, and a bit of pork, and younger ones devour hotdogs, hamburgers, and Baltic-style pizzas. Danish cuisine has some similarities with food from Switzerland and Austria, the second and third happiest nations according to the World Map of Happiness; this suggests that the consumption of comfort foods may be important for life satisfaction. Alcohol and smoking—High levels of smoking and drinking are associated with low wellbeing, but Danes are among those with the highest consumption in Europe. This is reflected in causes of death and low life expectancy.4 A reviewer of our paper suggested that one reason that Danes seem smug may be that they were drunk when they participated in the Eurobarometer surveys. General health—Good health is associated with life satisfaction. If self reported health is considered, Danes do well. When measured objectively, however, by diagnosed physical conditions and performance, the health of Danes is mediocre.6 The life expectancy of Denmark falls 13th among the 15 old EU countries (www.cia.gov/cia/publications/factbook/index.html). Welfare state—Cross national studies show that a prosperous economy and a well functioning democracy are associated with a high level of wellbeing,3 7 although longitudinal studies of life satisfaction do not indicate any stable changes as a result of a higher income.8 Denmark ranks number one in the Gini index, which is a measure of income equality,9 10 but is closely followed by Sweden, which is second in Europe. Virtually all historically Protestant societies show relatively high levels of subjective wellbeing.3 But again, Denmark does not differ much from Sweden and Finland in infrequency of church attendance or latent paganism. Exercise—There are more than 1.6 million memberships of sports clubs in a country of 5.4 million inhabitants (Ministry of Foreign Affairs of Denmark, www.denmark.dk). Furthermore, Danes use bicycles to a great extent for transportation, a feature they have in common with another high ranker in life satisfaction, the Netherlands. Expectations—The Eurobarometer surveys also contain a question about expectations for improvement in the coming year. It has been argued that great expectations of favourable life circumstances in the future should be associated with life satisfaction,13 but if the expectations are unrealistically high they could also be the basis of disappointment and low life satisfaction. The Eurobarometer data on expectations go back to 1980 and show that while Danes are very satisfied, their expectations for the coming year are rather low, ranking among the bottom half. In contrast, Italy and Greece, which rank lowest on life satisfaction, rank high on expectations for the year to come; together with Swedes and Finns they rank at the top. The causes of the stolid depth of Danish wellbeing are undoubtedly multifactorial. We are satisfied, however, that in the end and against all odds we have contributed to comprehension of the conundrum of Danish contentment. We doubt that further research would lead, in the foreseeable future, to deeper understanding, but decades of effort might possibly result in some incremental advance. Optimism is unwarranted. Our analysis points to two explanatory factors. The Danish football triumph of 1992 has had a lasting impact. This victory arguably provided the biggest boost to the Danish psyche since the protracted history of Danish setbacks began with defeat in England in 1066, followed by the loss of Sweden, Norway, Northern Germany, the Danish West Indies, and Iceland. 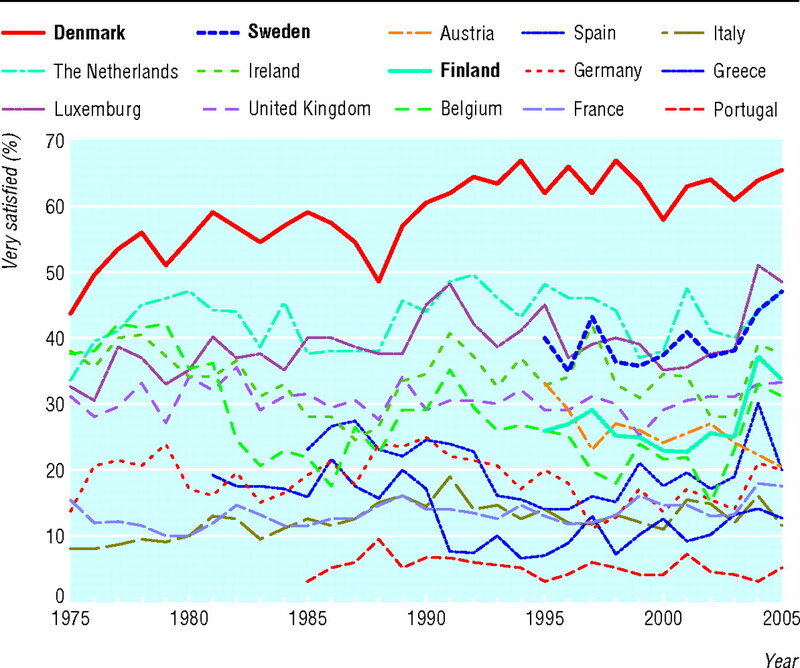 The satisfaction of the Danes, however, began well before 1992, albeit at a more moderate level. The key factor that explains this and that differentiates Danes from Swedes and Finns seems to be that Danes have consistently low (and indubitably realistic) expectations for the year to come. Year after year they are pleasantly surprised to find that not everything is getting more rotten in the state of Denmark. In this humbug-bloated holiday season, with an undoubtedly disappointing New Year approaching, we do not wish to foster false hopes. Some tepid comfort might perhaps be taken, however, in the fact that if you lower your expectations enough you might feel a bit better next Christmas. We thank Inge Petersen, Birgit Wich, Kirsten Pagh, Matt McGue, and Jeffrey C Murray. Contributors: KC, AMH, and JWV wrote the paper. KC is guarantor. Competing interests: We are very satisfied “lige nu” and have low expectations for the coming year. Suter D. Hair colour in the Faroe and Orkney Islands. Ann Hum Biol 1979;6:89-93. Lykken D, Tellegen A. Happiness is a stochastic phenomenon. Psychol Sci 1996;6:10-9. Inglehart R, Klingemann H-D. Genes, culture, democracy, and happiness. In: Diener E, Suh EM, eds. Culture and subjective well-being. Cambridge, MA: MIT Press, 2000:165-83. Jacobsen R, Von Euler M, Osler M, Lynge E, Keiding N. Women's death in Scandinavia—what makes Denmark different? Eur J Epidemiol 2004;19:117-21. Kohler H-P, Behrman JR, Skytthe A. Partner + children = happiness. The effects of partnerships and fertility on well-being. Popul Dev Rev 2005;31:407-45. Börsch-Supan A, Brugiavini A, Jürges H, Mackenbach J, Siegrist J, Weber G, eds. Health, aging and retirement in Europe. First results from the survey of health, aging and retirement in Europe. Mannheim: Mannheim Research Institute for the Economics of Aging (MEA), 2005. Diener E, Diener M, Diener C. Factors predicting the subjective well-being of nations. J Pers Soc Psychol 1995;69:851-64. Easterlin RA. Explaining happiness. Proc Natl Acad Sci U S A 2003;100:11176-83. Gini C. Variabilità e mutabilità (1912). In: Pizetti E, Salvemini T, eds. Memorie di metodologica statistica. Rome: Libreria Eredi Virgilio Veschi, 1955. Countries by income inequality metrics based on the Gini coefficient. In: United Nations Development Programme Report. New York: UNDP Publications, 2005. Kirkup W, Merrick DW. A matter of life and death: population mortality and football results. J Epidemiol Community Health 2003;57:429-32. Witte DR, Bots ML, Hoes AW, Grobbee DE. Cardiovascular mortality in Dutch men during 1996 European football championship: longitudinal population study. BMJ 2000;321:1552-4. Lyubomirsky S. Why are some people happier than others? The role of cognitive and motivational process in well-being. Am Psychol 2001;56:239-49.